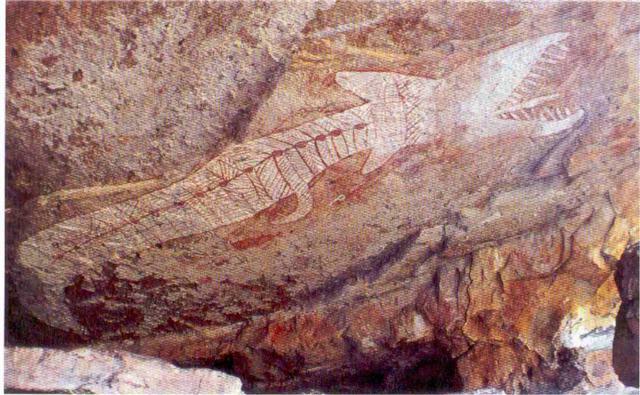 The Rainbow Serpent Shelter of Mount Borradaile in Arnhem Land, N.T., Australia, has a beautiful painting of a Serpent, symbolizing the Egyptian god Maat. A Second Painting shows the discovery of Australia by the 2nd king Djoser of the Third Dynasty (c.2753-2723 BC). It also tells the story of the Flood, which ended the Old Kingdom. This painting dates from the First Intermediate Period (c.2190-2007 BC). The painting of the Serpent is probably slightly older (c.2750-2007 BC). 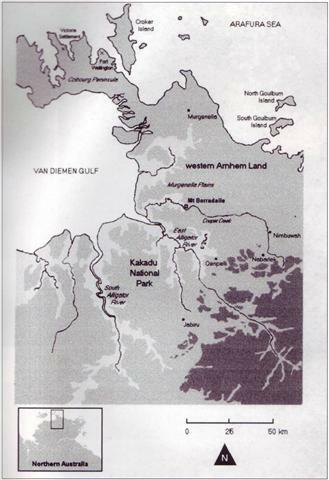 Arnhem Land is the upper region of Northern Territory, Australia. Mount Borradaile is located at Cooper Creek, at 12oS. It is in the northwest of this area, above the East Alligator River (fig.3). Both rivers empty in the Van Diemen Gulf in the west. Mount Borradaile is located at a distance of 25km from the coast, and about 50km northeast of the well-known Kakadu National Park. The whole area is famous for its prehistoric rock paintings. Some of these are made by the oldest inhabitants of Australia, more than 10,000 years ago. The Rainbow Serpent Shelter is totally different. At first sight there is only one splendid painting of an enormous Serpent (fig.1). It has a length of 6.1 meters (20 feet), the longest serpent drawing in Australia. Its big head resembles that of a dragon, with rows of fearsome teeth in the jaws. The distance between the tips of the distended jaws is almost a meter. The spine and rib structure of the beast are carefully indicated. The whole composition is beautifully painted, with fine lines of red ochre on a white background. Authors Roberts and Parker write in their book "Ancient Ochres, the Aboriginal Paintings of Mount Borradaile"1: "This is a dry, accessible shelter with no signs of habitation, indicating that it was strictly a ceremonial site. There are various habitation shelters in the immediate vicinity. In this particular shelter there is very little art other than the main image, and there have been no images superimposed over any part of it. Clearly, this is testimony to the importance of this painting." We believe this Rainbow Serpent is the symbol of Maat, the Egyptian god of law and order in the universe.2,3 This god was already important before the official start of the Egyptian civilization, with the 1st king Menes of the First Dynasty (c.3100 BC). The distant island of Australia was reached centuries later, when this civilization flourished as never before. Slightly later, c.2500 BC, the Egyptians discovered the Atlantic Crossing to Central America. It was considered as 'The Realm of the Dead in the west, at the other side of the waters (the Atlantic Ocean), the Land where the Sun sets'2-12 The 18 units just mentioned may refer to the south point of the Gulf of Campeche, Mexico, the center of the holy Land of Punt, at 18oN. It also corresponds to half of the circumference of the planet Earth, 18 Moiras, or 180o which was considered as the distance to the 'Underworld'. It might also encode the south point of Carpentaria Gulf, Australia, at 18oS, not far from Mt. Borradaile, if this area was considered holy as well. This site is located 18-12= 6o south of the Serpent Shelter, referring to the six dynasties of the Old Kingdom. All these important discoveries happened in this early time period! Besides the Serpent is another, white painting in the cave (fig.2), having a surface area of more than half a square meter.1 Three thick horizontal lines, which start from a mutual point at the left side, are cut by a curved, vertical line in the center. A possible interpretation is easier now, because a line may represent a Royal Lineage, or Dynasty. The first three lines could represent the first three Dynasties of Egypt. The curved, vertical line may symbolize the coast of the continent of Australia. The left part of the painting appears to mean, that Australia was discovered by Egyptians in the Third Dynasty (c.2769-2678 BC). The petroglyphs in the passage grave of Dissignac in Brittany, France, confirms it.2,3 It has a glyph of a coast map of Australia, dated c.2700 BC. The painting contains a second piece of information. A line may also represent the period of reign of a king. The 2nd line at the left side produces 2 lines at the right side. So, it is indicated twice, that the 2nd king Djoser (c.2753-2723 BC) discovered Australia. More than three different 'artifacts' are known, which confirm it.4-7 The three lines at the left side confirm his thirty years of reign. Mount Borradaile is located at 12oS. The latitude line of the site hits Cape York, Queensland, in the east. It shows the discovery of Australia via the eastern crossing from the island of New Guinea to this Cape, 12 Moiras, or 120o east of the Nile Delta, when measured along the equator. The meridian, or NS-line, of Mount Borradaile hits little Oxley Island in the north, at 11oS, 11 Moiras, or 110o east of the Nile Delta. It illustrates twice the simultaneous discovery of the western crossing from the southern island of Roti, Indonesia, at 11oS, to the Kimberley District (West Australia). The meridian of the Serpent Shelter (at 133o) hits the South Coast of Australia, at 32oS. This is 32-12= 20o or 2 Moiras to the south, confirming both discoveries by the 2nd king Djoser. The whole painting shows Australia has known the important influence of the Old Kingdom, between the Third and the Sixth Dynasty. This 2nd painting, in honor of the 2nd king Djoser, deals with the ancient Egyptian influence in Australia, and so does the big Rainbow Serpent, representing the Egyptian god Maat. The whole painting now represents a Comet (or Comet Swarm). The white area at the left side is the head of the Comet, consisting of ice and stones, and the right side symbolizes the tail of the Comet. The vertical curved line is now the path of the planet Earth through the tail of the Comet. The Comet consists of 3+4= 7 lines. The path of the Earth through the Comet consists of 2 lines, the upper half and the lower half. So, the whole painting consists of 7+2= 9 lines, encoding the 9 months for the shown woman to give birth. So, each line may correspond to a month. The tail of the Comet consists of 4 lines. So, the whole calamity lasted for a time period of 4 months. The 2 closely spaced lines in the center show the Earth disappeared in the tail of the Comet for a period of 2 months. The falling rocks caused huge forest fires, and the melting ice of the Comet caused torrential rains. There were huge foodings everywhere. It was completely dark on Earth. This time period was probably the worst. The meridian of Mount Borradaile passes through Doberai Peninsula, New Guinea, over 2o (from the equator to 2oS), confirming the first time period of 2 months. The width of the island of New Guinea equals 2 Moiras, confirming it. The meridian also passes through Bomberai Peninsula over 2o (from 2oS to 4oS), confirming the second time period of 2 months. The distance from Mt. Borradaile to the South Coast of Australia equals 20o (from 12oS to 32oS), confirming it. The meridian passes across the Pacific Ocean from the north coast of New Guinea via Japan to the South Coast of Russia, near the present town of Nahodka, over 4 Moiras, confirming the whole time period of 2+2= 4 months. Mt. Borradaile is located at 12oS, confirming the duration of the Flood, 4x30= 120 days. The Comet consists of 3+4= 7 lines (fig.2). So, there were millions of casualties (a number of 7 figures). The curved, vertical line hits the bottom of the dead woman. It consists of an upper half and a lower half. So, there were 2 million casualties. The lowest line of the tail of the Comet hits the head of the woman. The right part of the painting has a total of 2+4= 6 lines. The tail of the Comet consists of 4 lines. So, there were an additional 4 hundred thousand casualties (a number of 6 figures). It appears, there were a total of circa 2.4 million casualties. The dead person clearly is a woman, because she is depicted with long hair and breasts. This drawing consists of 7 thin lines, confirming the millions of victims (a number of 7 figures). The number of women on Earth equals the number of men. So, it appears there were also circa 2.4 million survivors. So, before the Flood the world population was apparently 2.4+2.4= 4.8 million men. The meridian of Mt. Borradaile hits the archipellago of Oki-Shoto, Japan, at 36oN. It is 12+36= 48o above the Serpent Shelter, confirming the initial world population of 4.8 million men. The latitude corresponds with the circumference of the planet Earth, 36 Moiras, or 360o confirming it was a worldwide Catastrophe. The relative latitude difference determines the exact number of casualties, (48/90)x4.8= 2.6 million men (54%). The complementary latitude of Oki-Shoto, at 90-36= 54oN, confirms the percentage. The exact number of survivors turns out to be 4.8-2.6= 2.2 million men. Most of them were seriously wounded. The meridian hits the South Coast of Russia, near the present town of Nahodka, at 42.5oN. Rounded off, the latitude equals 42oN. The complementary latitude of 90-42= 48oN confirms all the mentioned numbers, again. The meridian of Mount Borradaile hits the south coast of New Guinea 8o above the site, at 12-8= 4oS. It shows, the total precipitation during the Flood was about 80 micromoiras= 80x0.11= 8.9, or c.9 meters of water. It should be compared with the normal precipitation in this area of 1.4 meters of water per year. In a way, the painting consists of 7+1= 8 lines, confirming it. The complementary latitude of the Serpent Shelter encodes a place in Antarctica on this meridian, at 90-12= 78oS. It confirms the precipitation, partly as snow and hail, about 78 micromoiras. Little Oxley Island is located at 11oS. The complementary latitude of 90-11= 79oS confirms it, again. All these details are known from several other monuments and petroglyphs all over the World.15 In the Bible this Comet Catastrophe has been described as the Deluge or the Flood. The Second Painting probably dates from the First Intermediate Period (FIP), c.2190- 2007 BC, which is the time period after the Old Kingdom. The big Rainbow Serpent might be older, possibly already dating from the Third Dynasty, so c.2750-2007 BC. 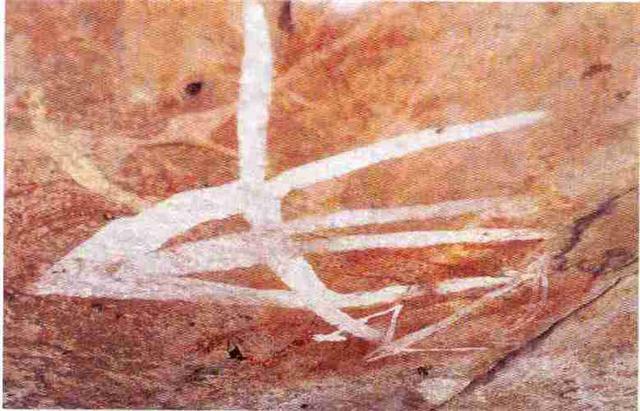 Both datings are much older than previously suggested (c.500-2000 AD).1 There are many reasons to believe, that the Second Painting was made after the Rainbow Serpent. The Serpent symbolizes the power of the Old Kingdom, while the Second Painting deals with the end of this civilization. 1. Roberts, D.A., and Parker, A., "Ancient Ochres, The Aboriginal Paintings of Mount Borradaile"; J.B. Books, Australia, 2003 (ISBN 1-876622-42-3), pgs.7,66-68. 2. De Jonge, R.M., and Wakefield, J.S., How the SunGod Reached America c.2500 BC, A Guide to Megalithic Sites, 2002 (ISBN 0-917054-19-9). Available: MCS Inc., Box 3392, Kirkland, Wa 98083-3392, also on CD. 5. De Jonge, R.M., "The Discovery of Three Continents (Santo Stefano, North Sardinia, Italy, c.2300 BC)" Ancient American, Vol.12, No.76, pgs.28-29 (2007), Ref.4. 6. De Jonge, R.M., "The Battersea Shield (River Thames, London, c.190 BC)" Ref.4, to be published. 7. De Jonge, R.M., The Phaistos Disc Decoded, New Testimony of a Lost Civilization, Midwestern Epigraphic Journal, Vol.20, 111-115 (2006), and Vol.21, 74-80 (2007), to be published. 8. De Jonge, R.M., "Houghton Petroglyph (Copper Country, Michigan, 2500-1200 BC)" Ref.4, to be published. 9. De Jonge, R.M., "The Mystic Symbol, mark of the Michigan Mound Builders" Ref.4, to be published. 10. De Jonge, R.M., "Four Ancient Stories (Poverty Point, NE Louisiana, c.700 BC)" Ref.4, to be published. 11. De Jonge, R.M., "Discovery of America and the Flood (c.2300 BC, Ita Letra, Villarrica, Paraguay)", Ref.4, to be published. 12. Wakefield, J.S., and De Jonge, R.M., Rocks & Rows, Sailing Routes across the Atlantic and the Copper Trade, MCS Inc, 2010 (ISBN 0-917054-20-2). Available: MCS Inc, Box 3392, Kirkland, Wa USA 98033. 13. Casson, L., Ships and Seafaring in Ancient Times, British Museum Press, 1994 (ISBN 0-7141-1735-8). 14. Wachsmann, S., Seagoing Ships and Seamanship in the Bronze Age Levant, College Station, Texas, 1998. 17. Peiser, B.J., "Evidence for a Global Disaster in the Late 3rd Millennium BC" Ref.16, pgs.117-140. 18. Baillie, M.G.L., "Hints that Cometary Debris played some Role in several Tree-Ring Dated Environmental Downturns in the Bronze Age" Ref.16, pgs.109-117. 22. Grondine, E.P., Man and Impact in the Americas, Kempton, Illinois (2005) (ISBN 0-9776-152-0-0).